Nigeria is a large state in western Africa which opens out onto the South Atlantic Ocean. It is bordered to the north by Niger, to the east by Cameroon, and to the west by the state of Benin, which can cause some confusion, as Nigeria itself was home to the Benin empire which appeared at the start of the fifteenth century. The first kingdoms emerged in the late first millennium AD. When the Nubians conquered Meroë at the start of the sixth century BC, some of the Meroë fled west and ended up establishing themselves in what is now Nigeria and Benin. This is known because the priesthood in these countries uses technical words which are Semitic. One of these is 'Al' as a prefix, used in the names of their spirits (angels). The word also lent itself to the name of the medieval state of Alodia. Benin is one of the southern Nigerian states which claim to have obtained kingship from the Yoruba city of Ife. However, archaeological research at Benin has shown that important developments preceded the foundation of the empire. In the countryside around Benin City lies an extraordinary complex of walls, thirty feet high in places and stretching perhaps 15,000 kilometres (10,000 miles) in length. Because they are older than the walls of the city which became the capital of the Benin empire, historians believe that the region was the home of a large population before the emergence of a centralised state. The empire was located largely in what is now south-western Nigeria, to the east of Yorubaland and west of the River Niger, but also with areas which now lay in eastern Benin. The region was populated by speakers of a group of closely related languages called Edo. The Benin kingdom was originally founded around AD 900 as a small city state, possibly the same kingdom of Oyo which was responsible for founding Ibinu (Benin City) around AD 1170 or 1180. Known in its early years as the kingdom of Igodomigodo (although precisely when is unclear), it began to expand into the thirteenth century. It was unified with the territory of surrounding tribes around 1300. The Benin empire was born, although it may have been better known by its own citizens as the Edo empire. Information on the empire is extremely sketchy, with many gaps. Even the story of the empire's founding is debatable. It was ruled by a regent called the oba. The modern oba of Edo (now within Nigeria) is still highly respected, although his powers are largely ceremonial. 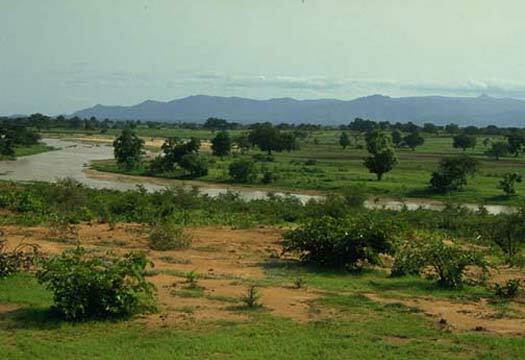 The Jos Plateau is settled by the Nok people, a Neolithic and Iron Age civilisation. The city of Ibinu (later called Benin City) is founded by Eweka, ruler of Oyo. According to traditional accounts, the original people of the Benin area, the Bini, are initially ruled by the ogisos ('Kings of the Sky'). About thirty-six ogisos rule the kingdom of Igodomigodo, although the available information in this regard is sometimes contradictory and poorly explained. Now as first oba of Benin, Eweka begins the kingdom's expansion. Ruler of Oyo. First oba of Benin. Grandson of the previous osigo. Second oba of Benin. Name unknown. Third oba of Benin. Name unknown. Fourth oba of Benin. Name unknown. Fifth oba of Benin. Name unknown. Sixth oba of Benin. Name unknown. Seventh oba of Benin. Name unknown. Eighth oba of Benin. Name unknown. Ninth oba of Benin. Name unknown. Tenth oba of Benin. Name unknown. 11th oba of Benin. Name unknown. 12th oba of Benin. Name unknown. Under Oba Ewuare, the kingdom, now known as Benin, becomes an empire through conquests which range from Idah to the north, and from Owo and Akure to Igboland, west of the Niger. The oba give Benin a strong central government which weakens opposing political factions. In 1470 the state is renamed from Benin to Edo. Spread Christianity throughout the kingdom. According to some English visitors, the oba can field twenty thousand warriors in one day, and up to 100,000 men if necessary. Oba Esigie, in an effort to spread Christianity throughout his realm sends Ohen Okun, the olokun priest at Ughoton, as an ambassador to the king of Portugal to ask him to send priests to Benin to teach him and his people about the Christian Faith. He also allows churches to be built in the city at Ogbelaka, Idumwerie and Akpakpava. The oba and the king of Portugal exchanged valuable gifts and a Portuguese ambassador is accredited to Benin (or Edo, as it has been renamed). The empire becomes rich by selling slaves from enemy states to the burgeoning slave trade with Europe, where they are carried to the Americas in Dutch and Portuguese ships. The Bight of Benin's shore soon comes to be known as the 'Slave Coast'. Son. 30th oba of Edo. Since the thirtieth oba, Akengbuda ends his reign in 1804 and the thirty-first begins his reign in 1814, there seems to be an interregnum in the kingdom in this period. The circumstances are unknown, but could it be related to the founding in 1809 of a single Islamic state, the Sokoto caliphate, to the immediate north of the empire? The caliphate claims territory which roughly covers all of northern modern Nigeria. Son. Ruled for 8 months. Civil wars plague Yorubaland in the south. Britain establishes a presence around Lagos and from 1861 governs what it calls the Colony and Protectorate of Nigeria by indirect rule through local leaders. Son. Deposed in 1897 by the British. Died in exile at Calabar, 1914. The monarchy is suppressed on 9 September 1897 by Britain as direct colonial rule is instigated. Only on 24 July 1914 is the monarchy restored while the state is known as the 'Colony and Protectorate of Nigeria'. During that time, in 1901-1902 the Northern Nigeria Protectorate is formed out of the territory of the Sokoto caliphate from 1900 and areas of the defeated Bornu empire formerly under the command of the Zobeir dynasty from 1902. The Southern Nigeria Protectorate is itself a merger between the Niger Coast Protectorate and territories which had been under the control of the Royal Niger Company. The Lagos Colony is added to this in 1906. The two protectorates are amalgamated in 1914 to form a single administrative body, largely due to financial necessity. Part of the former German colony of Kamerun is added to Nigeria under a League of Nations mandate. Son. Born 1899. Remained titular oba after independence. Nigeria achieves independence from Britain as the 'Federation of Nigeria'. Nigeria is located on the southern coast of Western Africa, one of a jumble of smaller states along the Gulf of Guinea, although in fact Nigeria is just about the biggest of these. It is bordered to the east by Cameroon, to the north-east by Chad, to the north by Niger, and to the west by Benin. The modern 'Federal Republic of Nigeria' has its capital at Abuja, virtually dead-centre in the country, which has its own administrative area called the Federal Capital Territory. Modern Nigeria is an amalgam of several older states which had been merged by British control into two regions: the Southern Nigeria Protectorate and the Northern Nigeria Protectorate. The southern protectorate was itself a merger between the Niger Coast Protectorate and territories which were under the control of the Royal Niger Company. The Lagos Colony was added to this in 1906. The northern protectorate encompassed territory of the Sokoto caliphate from 1900 (which covered much of what is now northern Nigeria) and areas of the defeated Bornu empire formerly under the command of the Zobeir dynasty from 1902 (which lay to the immediate north-east of the caliphate - the corner of modern Nigeria which borders Chad and Niger). The caliphate had been formed in 1809, immediately to the north of the former Benin empire. Amalgamation in 1914 between the northern and southern protectorates was largely due to financial necessity, with the north running a deficit. With the advent of independence from Britain in 1960, Prime Minister Sir Abubakar Tafawa Balewa led a coalition government. 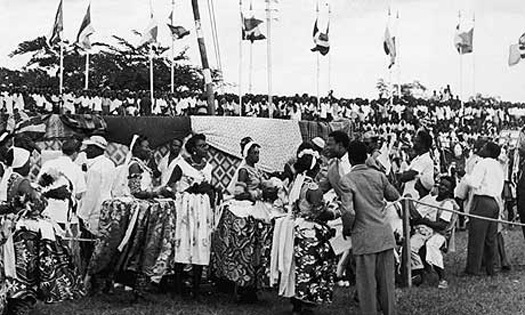 However, in 1961, South Cameroon decided to join the republic of Cameroon to the east, while North Cameroon remained within Nigeria. On 24 May 1966 the parliamentary system was abolished when the Federal Republic of Nigeria was declared. In the following year the eastern region of the country - comprising three states - seceded as the republic of Biafra, although this was not internationally recognised. These areas had lain outside the former Benin empire and Sokoto caliphate, and its people felt that they could not be dominated by these more populous regions. While this break-away territory was eventually pulled back into Nigeria, elements in the Sokoto north have caused longer-lasting problems with their wish for an Islamic-dominated state. Since independence the titular oba has had no political power. However, he is still recognised as a symbol of authority. Successive holders of the title are shown below in normal text but with a shaded background to highlight the fact that they have been sidelined. Military seizures of official power were often headed by army officers, and these are shown with a normal background as it was these people who ran the country. Rival claimants to control of the nation are shown with a shaded background and in green text. Titular oba since 1933, but with no political power. Died 1 Dec. In January, Prime Minister Sir Abubakar Tafawa Balewa is assassinated during a coup. Major-Gen Johnson Aguiyi-Ironsi is now in command of a military administration, ending the brief 'First Republic' period. The Federal Republic of Nigeria is declared on 24 May, but a counter-coup is launched in July and Ironsi is killed. This time Lieutenant-Colonel Yakubu Gowon heads up the administration. Army major-general who lead a coup. Killed. Army lieutenant-colonel who lead a counter-coup. Usurped. Three eastern states secede from the country and form their own independent state known as the republic of Biafra. It is not internationally recognised but the act does spark a bloody civil war, known as the Biafran War or Nigerian Civil War. In 1970, Biafra is reintegrated within Nigeria after its leaders surrender. Yakubu Gowon is overthrown and flees to Britain. He is replaced by Brigadier Murtala Ramat Mohammed, who begins the process of moving the federal capital to Abuja in the very centre of Nigeria. Mohammed is assassinated during a failed coup attempt. He is replaced by his deputy, Lieutenant-General Olusegun Obasanjo, who helps to introduce an American-style presidential constitution. Army lieutenant-general. Oversaw the move to elections. Son of Akenzua. Born 22.06.1923. Died before 29.04.2016. Elections bring Alhaji Shehu Shagari to power and, perhaps remarkably, he manages to retain it. Ghanaians have been migrating into the country during a period of disruption in their own country, but in January 1983 the government expels more than one million foreigners, mostly of them Ghanaians, stating that they have overstayed their visas and are taking jobs from Nigerians. The move is condemned abroad but proves popular in Nigeria. Between August-September, President Shagari is re-elected amid accusations of irregularities. The situation boils over in December when Major-General Muhammad Buhari seizes power in bloodless coup. Army major-general. Seized power in a coup. Having terminated the country's 'Second Republic' period, Muhammad Buhari curtails political activity. The 1970 constitution is suspended amid claims that 'a flawed democracy is worse than no democracy at all'. In 1985, Ibrahim Babangida seizes power in another bloodless coup, and he also curtails political activity. Buhari is imprisoned for a time, but is eventually released unharmed. In June, the military annuls elections when preliminary results show a victory for Chief Moshood Abiola. In August power is transferred to an interim 'National Government'. 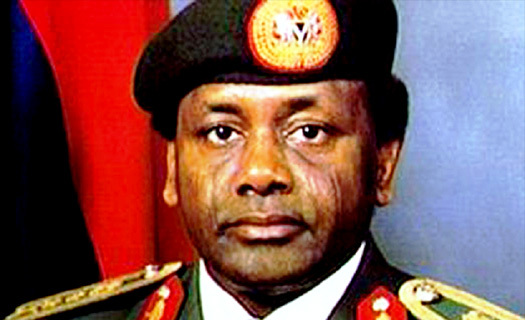 General Sani Abacha emerges from obscurity in November to take over the presidency. He is the latest in a long line of military rulers in post-independence Nigeria and, like his predecessors, he is determined to maintain an iron grip on power. He proves himself to be a master of political craftsmanship by establishing five political parties, and then having them all approve his unopposed candidacy for an elected presidency. Only his death following a spell of ill health in 1998 ends his 'elected' rule. Army general. Took over presidency and ensured he kept it. Sani Abacha faces a minor crisis when Moshood Abiola declares himself president. He is arrested, and dies in custody in 1998. Curiously (or not), this is just a month after the death of Sani Abacha himself. Modern Nigeria is being run very much like a medieval monarchy, with seizures of the throne and eligible (or otherwise) contenders proclaiming their own position at the top and then being defeated and imprisoned. Claimant to the presidency. Arrested and died. Army major-general. Oversaw elections in 1999. Parliamentary and presidential elections are held in 1999, with Olusegun Obasanjo being sworn in as president. Despite the apparent return of democracy in a 'Third Republic', the country's misery has not yet ended. The following year sees the adoption of Sharia law by several northern states in the face of opposition from Christians. Tension over the issue results in hundreds of deaths in clashes between Christians and Muslims. Tribal war flares up in Benue State in 2001 (eastern-central Nigeria). This displaces thousands of people. Troops sent to quash the fighting kill more than two hundred unarmed civilians, apparently in retaliation for the abduction and murder of nineteen soldiers. In August 2006, Nigeria agrees to cede sovereignty over the disputed Bakassi peninsula to neighbouring Cameroon under the terms of a 2002 International Court of Justice ruling. In April 2007, Umaru Yar'Adua of the ruling People's Democratic Party is proclaimed the winner of the presidential election. It takes until August 2008, following agreement in March, for Nigeria to finally hand over the Bakassi peninsula to Cameroon, ending a long-standing dispute. Hundreds die in north-eastern Nigeria after the Boko Haram Islamist movement launches a campaign of violence in a bid to have Sharia law imposed on the entire country. The movement is loosely modelled on the Taliban movement in Afghanistan, but it suffers an early setback when security forces storm Boko Haram's stronghold and kill its leader. Violence between Muslims and Christians continues elsewhere in the country. In May 2010 May, President Umaru Yar'Adua dies after a long illness and is succeeded by Vice-President Goodluck Jonathan, who has already been fulfilling the duties of the president. In December, Christmas Eve bomb attacks near the central city of Jos kill at least eighty people. Further attacks which are claimed by Boko Haram spark even more clashes between Christians and Muslims. Some two hundred are killed in reprisal attacks. In March 2011, Vice-President Goodluck Jonathan wins the presidential elections, confirming him in the role he has already performed for a year or more. In August a suicide bomb attack on the UN headquarters in Abuja kills twenty-three people, with Boko Haram again claiming responsibility. Following December 2011 Christmas Day bomb attacks by Boko Haram on churches, President Jonathan declares state of emergency in an attempt to contain the violence. 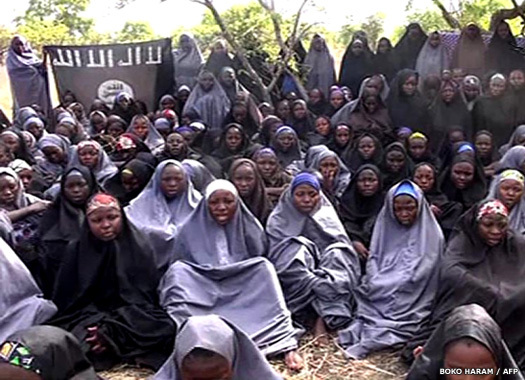 The violence is not contained, however, and in April 2014 more then two hundred schoolgirls are kidnapped from a boarding school in the northern town of Chibok. In August, Boko Haram proclaims a caliphate in the territory which it controls in the north-east, and in November the group launches a series of attacks in north-eastern Nigeria, capturing several towns near Lake Chad and running raids into neighbouring Chad and Cameroon in early 2015. This forces Nigeria, Chad, Cameroon, and Niger to form a military coalition against Boko Haram, which claims successes in pushing it back in all of these countries. The Nigerian army captures Gwoza, which it believes is Boko Haram's main stronghold, in late March 2015, leaving the armed group with only two towns under its control. The winner of Nigeria's presidential poll is Muhammadu Buhari. He hails his victory as proof that the nation has embraced democracy. He is the first opposition candidate to win a presidential election in Nigeria, and his opponent, Goodluck Jonathan, congratulates him and relinquishes power peacefully, urging his supporters to accept the outcome. The threat of Boko Haram in the north has played a large part in the election's outcome. The death of Oba Erediauwa is announced on 29 April 2016, but without stating precisely when he died or of what causes. As the oba and also a former federal permanent secretary to the government, his death is accorded reverential national coverage, even though it is believed by many Nigerians that his passing (seemingly related to an illness) had taken place long before the formal announcement. Son of Erediauwa. Born 1953. 39th oba of Benin.